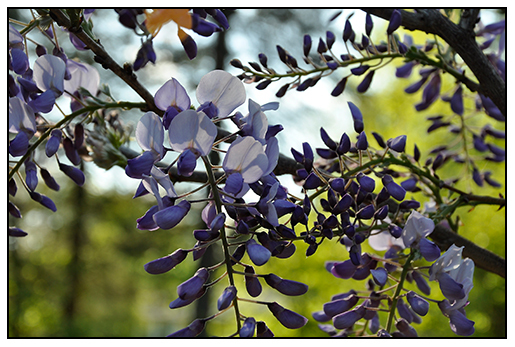 A tree wisteria is simply a wisteria vine, trained to grow as a tree - essentially, it is simply a wisteria standard or a wisteria topiary, if you will. 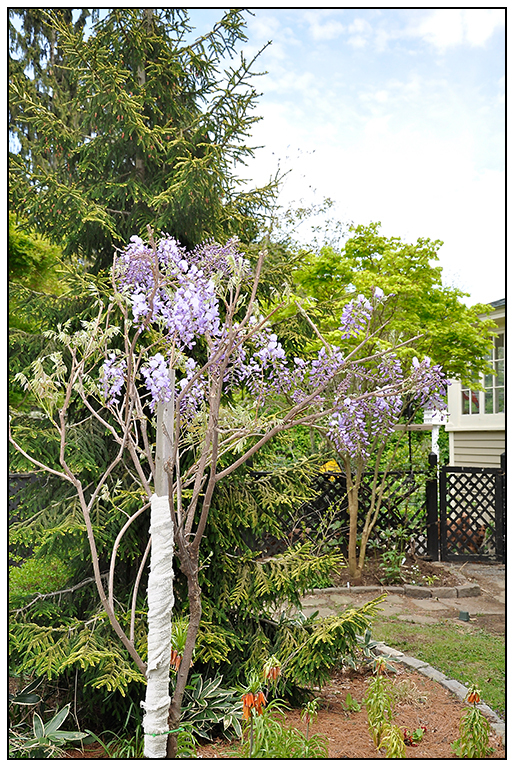 It takes many years, and careful and dedicated attention with hand pruners to achieve a mature specimen, but with grafted stock becoming more available ( to endure that flowering material is used rather then seedlings) a beautiful wisteria can be trained to grow into a small, weeping tree form in about ten years. I have seen some very impressive specimens in large, terra rosa pots, but these must be stored in frost-free conditions. 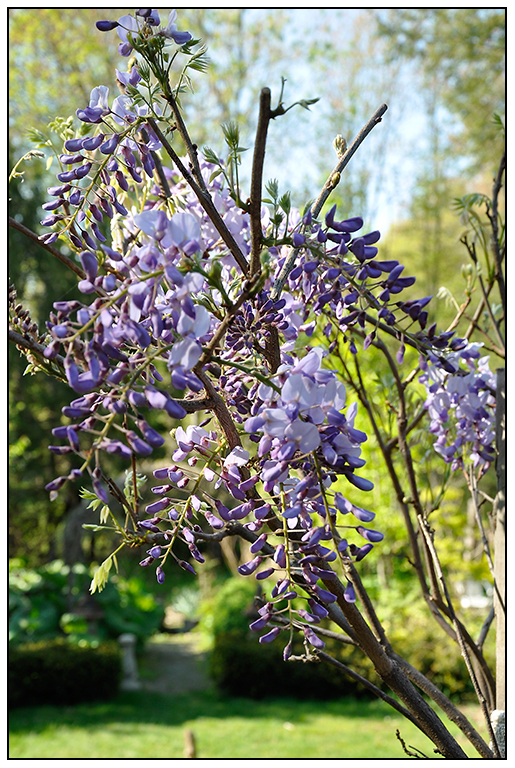 Wisteria can easily become a rampant weed, with runners creeping lightning fast across or just under the soil surface, or running up a tree quickly engulfing it, but there is no other plant quite like it, and a tree-form wisteria may be the best way to control a plant such as this vine. 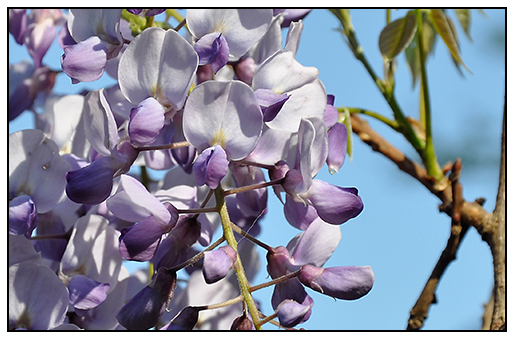 I suggest investing in a pre-trained graft, which can be costly ( $100 - $200) but it will guarantee both a selection that has the highest quality blooming stock, and a root stock that is less aggressive. Wisteria can be very fragrant, the scent reminds me of orange blossoms. It can drift across the garden on warm, spring days. Pruning aggressively is key, but always with a thoughtful eye. eventually, these tiny branches on this three year old specimen will mature into thick, trunk-like branches, making what was once a lowly vine, a stunning tree-like specimen. 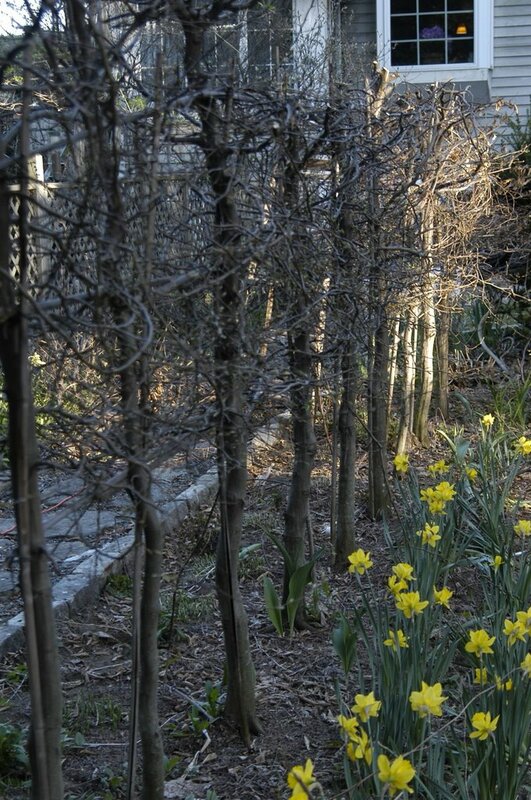 Pruning can occur throughout the year, but to endure blooms, it is best to prune heavily just after flowering. 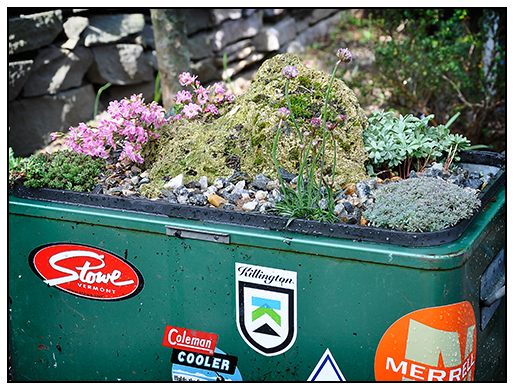 Here is a fun way to both recycle a vintage mid-century insulated metal Coleman cooler - convert them into an alpine trough. This is an experiment which I have been incubating since last year, since there is something appealing about the vintage metallic paint on these coolers as they often seemed to match old pickups or 4x4's - My inspiration here might be clear to anyone who has spent time at a ski resort town, and it is a recipe which includes influences from the snow sport, mountain bike and youth culture found in mountain resort towns around the world - I just customized this to my New England heritage, but I am working now on converting some very cool vintage red coolers with other stickers and graphics. Imagine the possibilities once you start getting creative. 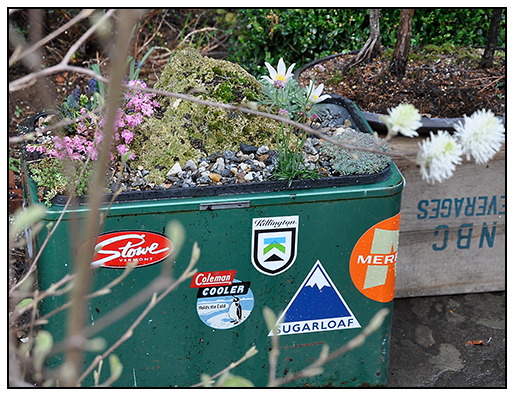 THE PLANTS HERE ARE A MIXTURE OF ALPINE PLANTS FROM SOUTH AMERICA ( THE OXALIS ON THE LOWER LEFT) TO LEWISIA, ON THE LOWER RIGHT NAMED AFTER MERIWEATHER LEWIS, SO A BIT OF MONTANA. MANY OF THESE COOLERS CAN BE FOUND FOR LESS THAN $20 ON EBAY, OR A LOCAL YARD SALES FOR $5.00, ESPECIALLY IF THEY ARE SLIGHTLY RUSTED, AS THIS ONE IS ( DOUBLE INSULATED, THE RUST OFTEN ONLY OCCURS ON THE OUTSIDE LAYER). 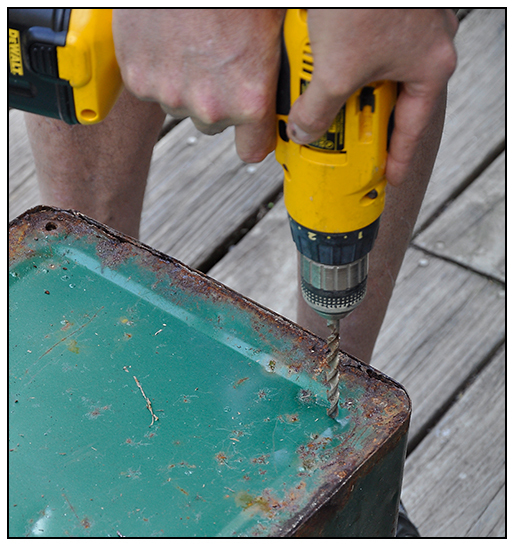 JUST DRILL HOLES IN THE BOTTOM EVERY THREE INCHES TO ENSURE THAT YOU HAVE DRAINAGE. A LAYER OF GRAVEL IS ADDED IN THE BOTTOM, WHICH MAKES THE COOLER HEAVY, BUT IT IS NECESSARY. 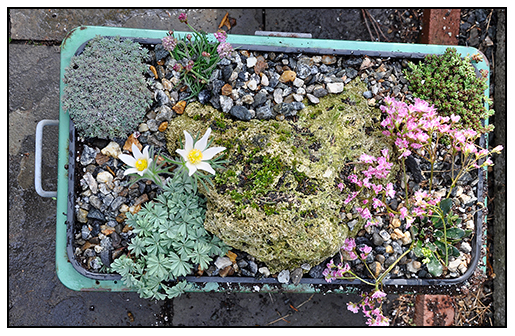 TODAY, MANY ALPINE PLANTS CAN BE FOUND AT YOUR BETTER LOCAL NURSERIES, BUT YOU MIGHT WANT TO TRY MORE INTERESTING ONES FROM A SPECIALIST GROWER. 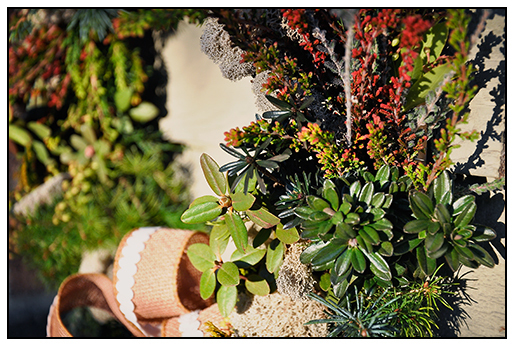 Alpine plants can be a broad term, if you are not too adventurous, you can simply use sempervivums or succulents, which will perform very well in a container like this, but if you want something more authentic, then you can mix in some rare or interesting alpine plants ( try ordering from Wrightman Alpines, or check out next Saturday's giant alpine plant sale at Stonecrop in Cold Spring New York, where on Saturday, April 28 from 9:00 am until 3:00 am, the 5th annual North American Rock Garden Society plant sale occurs. Some of the finest growers will be there, and they could even help you recreate a scene from your favorite mountain range ( The alps, Aspen, the Cascades, the Bitteroots). STICKER HELP WITH THE LOOK, BUT CURATE THEM CAREFULLY - THIS IS THE FUN PART. SEARCH ONLINE FOR STICKERS ON EBAY OR START COLLECTING THEM FROM YOUR FAVORITE RESORTS, MOUNTAIN BRANDS OR SOMETHING THAT MATCHES YOUR LIFESTYLE. 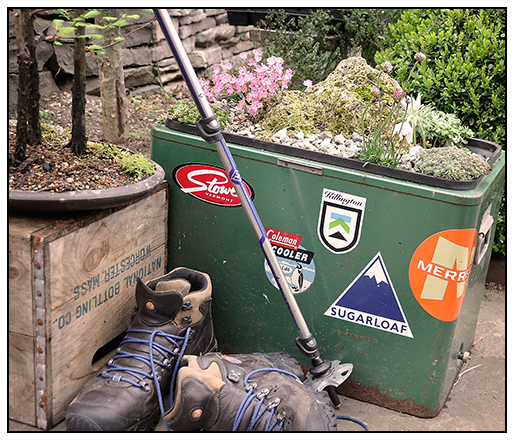 TRY ASKING FOR THEM AT YOUR LOCAL MOUNTAINEERING STORE, OFTEN THEY ASRE FREE. THEMES CAN BE AS STYLISH AS VAIL, AS POSH AS PONTRESINA, SWITZERLAND, OR AS EXTREME AS, OH, I DON'T KNOW, THE XGAMES. There is nothing quite like a tall massive container of Cyperus papyrus. 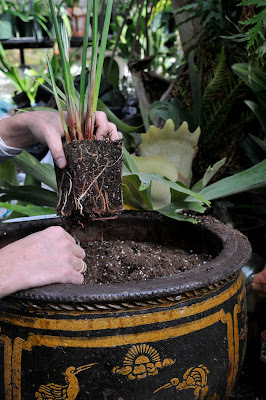 This weekend we picked up some 4 inch pots of a very tall strain at Logee's greenhouses, and potted them in 30 inch wide Chinese pots ( don't worry, they will fill these pots by mid July, and the volume is necessary if you want 6 foot tall specimens that will stop people in their tracks. These are moisture lovers, so either sit the pots in a pond or in large trays of water. Cyperus are not hardy in Zone 5, so plan on either bringing these beasts indoors in the winter or invest in new ones in the spring. This is one of those plants that everyone will ask you where you bought it, but rarely do you find them at nurseries for sale at full size. Just be sure to by the larger growing form, and not the dwarf. This plant is all about impressing people, so why not go all the way. 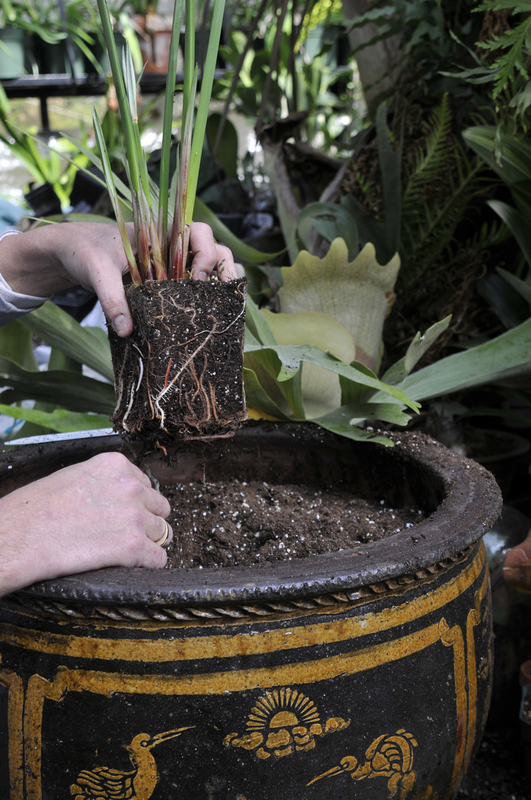 Just be sure to buy the largest container that you can, there is no such thing as over-potting this genus. 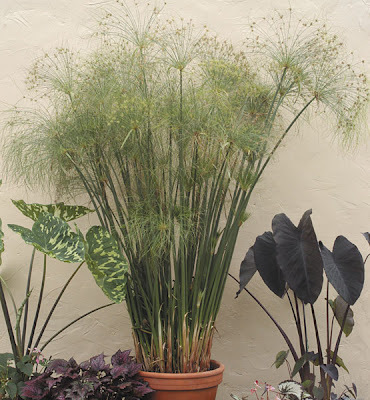 A mature giant Papyrus makes an impressive container plant in just one growing season. It loves heat and moisture, growing best in standing water. Use the largest pot that you can find, and stand back! I have so many plant show ribbons, that fill my closets and potting shed, which I just adore because of their wierd, innocent, naive color combinations, but which I can't decide what to do with. 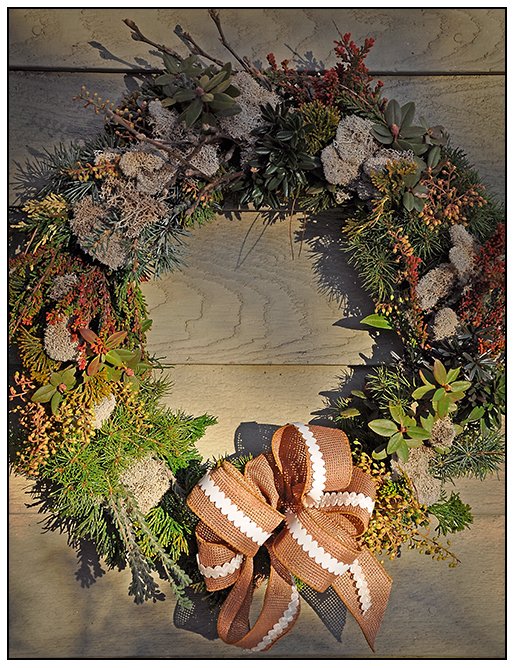 Thanks t Danny at Dailydanny, I have found the solution : wreaths. Anyone who exhibits in plant society exhibitions has boxes and drawers of rosettes, gathering dust and lint- why not display them? Best of all, this seems less like an ego blast, since let's face it, hang a blue ribbon anywhere, and the it's hard to avoid the obvious statement. 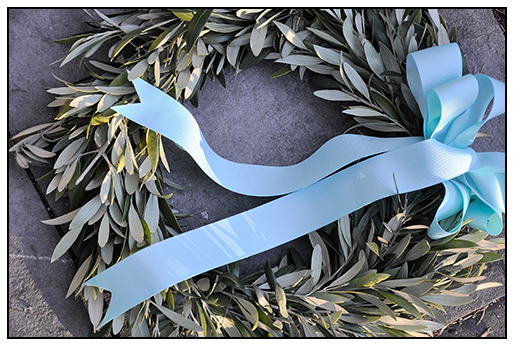 With a rosette wreath, like this assembleage, the statement is, well, understated, or better yet - over-stated, or overwhelmed by the art statement alone. Brilliant. 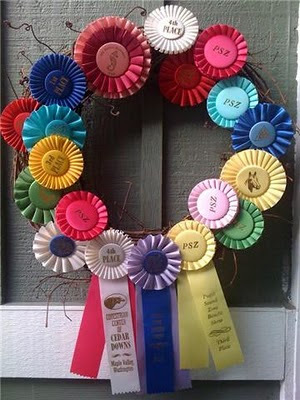 If you don't have any ribbons, just order your own from a horse ribbon company. You can order any color combo you want, and have them say anything you want. Try this one. Norogala Show Ribbons, it's where we order our plant society ribbons. 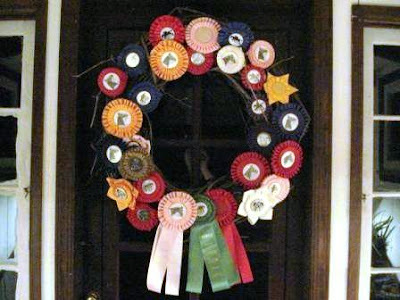 The cost is inexpensive, around $4.50 per rosette. Cheaper than roses. 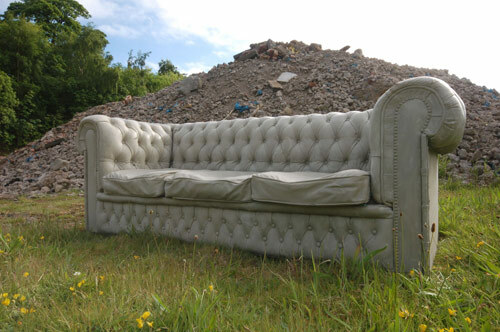 A concrete Chesterfield Sofa? Oh yes, not leather, but a real chesterfield cast in concrete, created by Steve Jones for a British concrete company, Gray Concrete. I am reminded of Rachel Whiteread, the UK contemporary artist who casts the negative space of objects, but this if far more useful ( and probably more affordable). It even has a coin cast behind a pillow for authenticity. This is a piece of garden furniture any man would appreciate. Next? A cast big screen tv anyone? times of Pliny the Younger. The form came back into fashion in Europe during the 16th Century, when the French clipped hedges and elaborate gardens with parterres complete with cones, spirals and even shapes that depicted animals. In Britain, the art form really thrived in the late 19th C., and it was the wealthy industrialists, who introduced the artform to America in their private estate conservatories and greenhouses. 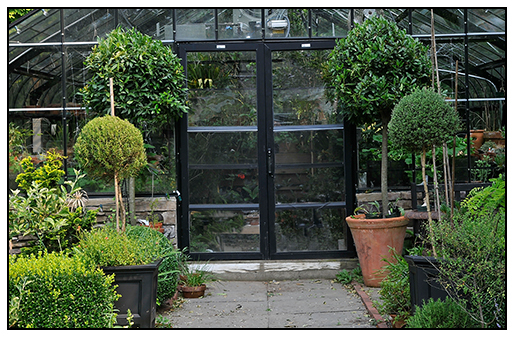 I really enjoy keeping and training various topiaried tender trees and shrubs, in the temperate greenhouse in my garden. Here, in my studio, I am giving some of the Myrtles a trim and clip, before returning them to the glass house where temperatures are colder, and moist. Nothing kills a Myrtle faster than the combination of winter dry air indoors, and a lack of water, which is what I will undoubtedly do. 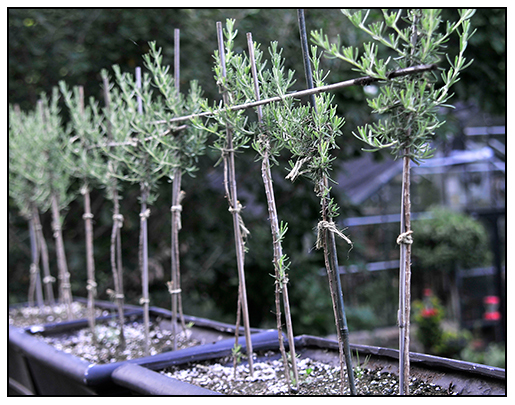 The same goes for Rosemary, of which, about a third of my topiary's are. 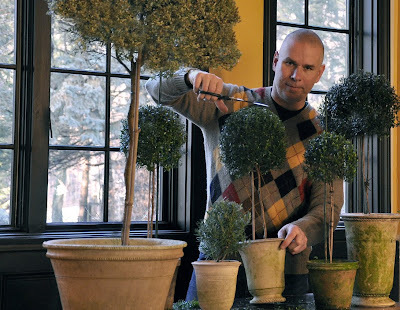 This past September, I took cutting from the various topiary trees I keep, so that new ones can be started, since there comes a point when they outgrow their size, and the sphere's become either too dense, or grow out of scale.I've let a number of Rosemary topiary freeze this autumn, since they seem to outgrow their form faster than Myrtles. Other Genus are kept in the greenhouse until they bloom, for they require different treatments, such as Citrus, Westringia and those plants in the legume family. 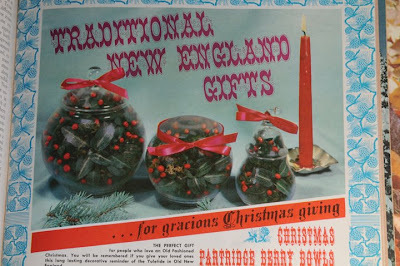 Born and raised in New England, I had grown accustomed to the Berry Bowl, a traditional craft which was simple, inexpensive and beautiful. It's been difficult to research the history of the Berry Bowl, but what little I could find, explained that colonial women would gather woodland plants in late autumn and early winter, and arrange or plant them in moss, also from the woods in a glass vessel, which would undoubtedly be something they had arround the house, such as a fancy glass, or a canning jar. 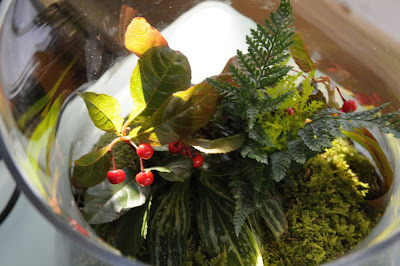 Essentially, this was a terrarium, which would last for the entire winter indoors, in a cold house, reminding them of the summer woodland. The plants in Berry Bowls are strictly limited to a few species, all grow in New England, and near my home in Massachusetts, and they include the Checker Berry ( which tastes like wintergreen), rattlesnake plantaoin, ( Goodyera pubescens), with it's white and green netted foliage, a native wild orchid and Partridge Berry ( MItchella repens) a vine which creeps along the forest floor and whose vivid bright red berries are most decorative once the leaves fall off of the trees, between October and Christmas. 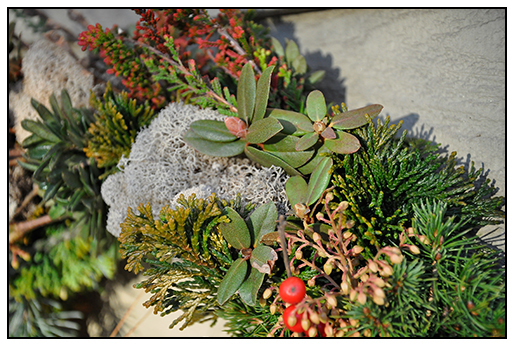 The Berry Bowl Reinvented with cultivated plants. 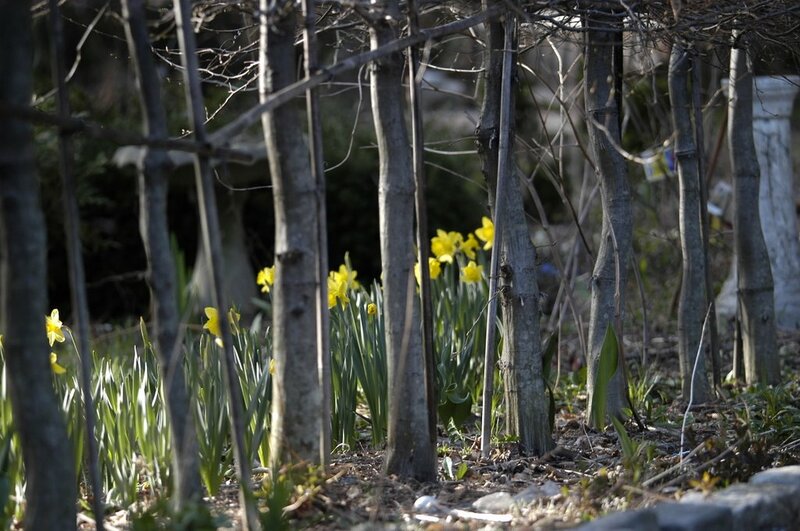 When I was young, I was quite active with the Worcester County Horticultural Society, a very active and prosperous Horticultural Society ( now transformed into Boston's premier Horticultural center, the Tower Hill Botanic Garden). In the 1960's and 1970's, I was very active in competitive classes in the Society's annual exhibitions, and the Holiday exhibition was most competitive, with classes to enter in such things as Della Robia swags and wreaths' ( think- old Della Robia paintings, or better yet, Xmas decorations at Colonial Williamsburg with lemons, oranges, other citrus, pineapples and greens), and classes like Pomanderballs ( clove studded citrus), and most competitive, the Christmas Tree decorating section, I don't know what I was thinking competing against garden clubs and private estates, but even though I was out of my league, and 30 years younger than everyone else ( I think most joined these old societies for the cocktail party opening events,- I mean, founded in 1856, china in the old kitchens with the seal of the society on them, cocktail trays,...) but since I could not drink yet, it was the Berry Bowl class which I would enter, which at least would get me out into the woods for a week searching for the perfect Goodyeara or even a Pipsissewa ( Chimaphila maculata) if I was lucky to tear out of the ground. Not unlike truffle hunting, each competitor had their own secret source for such rarities. 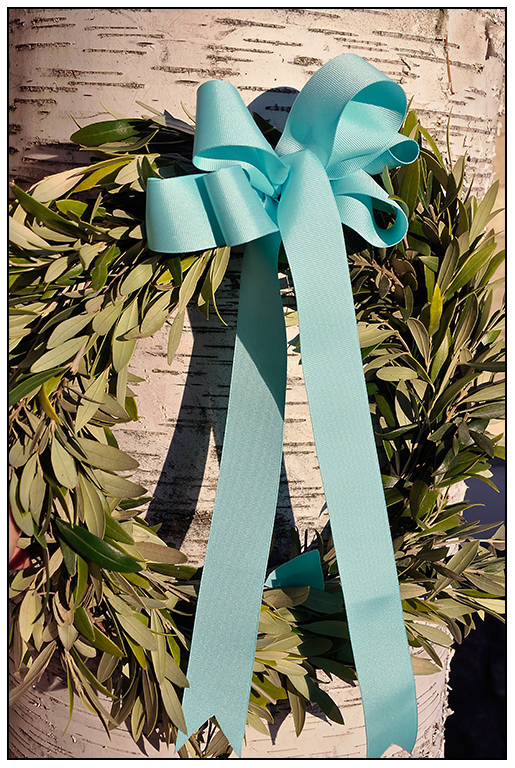 I still can;t look at Richard Jordan, another local boy who, in a year with no sign of a Rattlesnake Plantain in a 20 mile radius, would show up with a massive glass brandy snifter with three stunning specimens, claiming the cash prize of $6.00 and the treasured State Rosette. My New Berry Bowl Experiment. Today, things are different. I can't imagine collecting wild orchids and 'secret sources' for Partridge Berries' from the 'wild', although not all on the endangered species list, most of these plants are, or should be protected. So in my search for a replacement, I am trying some experiments. All the same, I have some rules, such as, keeping the same aesthetic and a similar species list, with substitutions. Here is my first attempt which I tried yesterday. Moss from the woods, and instead of Partridge Berry, I used some cuttings that I took of the Japanese evergreen Ardisia, which I grow in the greenhouse, and combined this with a relative of the Goodyera orchid, another 'Jewel Orchid', (Sarcoglottis septrodes), which I selected for it white veined foliage. 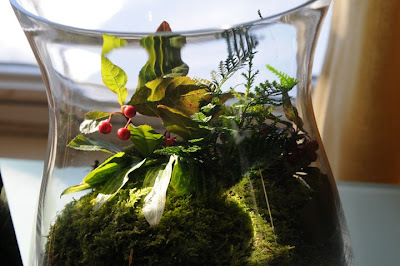 I used a glass vessel that one would place a pillar candle in, a sort-of hurricane glass, in which I placed a layer of pebbles, a tuft of Sphagnum moss, since the Sarcoglottis will need moss and not soil, and then I used the root ball of the Ardisia which is composed of mainly Pro Mix, a commercial soiless mix intact, but placed deep into the moss. The entire surface was then covered in a tuft of moss, and in that, I planted a cutting from a Rabbit's foot fern ( in place of the Rock Polypody, which would have been easy for me to 'collect' from the granite boulders in the woodland behind my house, but irresponsible, to do so, none the less. I feel pretty great with the results. 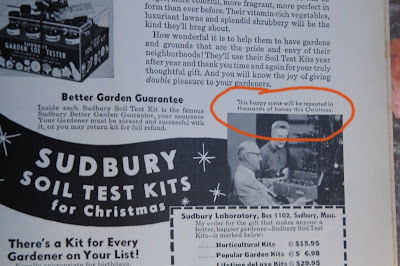 Everyone loves a soil test kit for Christmas. Double click the image to see the caption, ahhh.....the 50's. This week I pruned the pleached Hornbeam hedge along the stone walk that leads out to the woods behind the house. 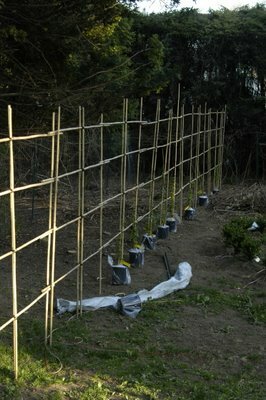 I also decided to plant a new Pleached hedge of Hornbeams (Carpinus) along a new herb garden that I am planting on a very messy side of the house, since a huge 200 foot long Hemlock Hedge (Tsuga canadensis) that has been providing privacy in our yard since my grandfather planted it nearly a hundred years ago, is weakening and soon will be gone, due to an infestation of the Woolly Adelgid. Pleaching is a ancient method of weaving branches to produce a hedge, often with the trunks showing. This French method is time and labor intensive, something that should make me reconsider the project, but on the other hand, it makes it seem even more attractive. Pleaching comes from the work Plechier, to weave, and one must use a tree species with flexible branches. Hornbeams are traditionally used, but one may also use Beeches. The new planting will take at least five years before it starts to look good, but the bamboo structure helps to make the area seem less ugly.